My beast before I had the Harley. Zero to plenty in much less than twenty! This thing is a monster! 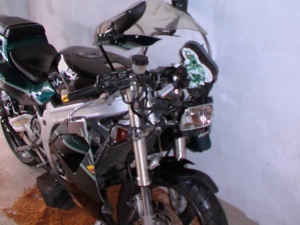 This was Tufan’s ride after his accident. 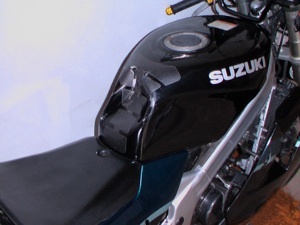 Suzuki RG125. Goes like klappers, 2-stroke little hooligan machine. Alas another road user did not “Think Bike” and Tufan met him head-on. Thankfully Tufan came out of it with no major injuries, although I think his children will have blue eyes! (see right). My ride before I got the V-Max. A sweet riding, monster sounding 400CC Steed. Awesome V-twin power! Swing your leg over her and she rewards you with the sweetest of purrs! Second to only the V-Max, the Goldwing GL1100 Interstate is an awesome machine, never complaining and always willing. 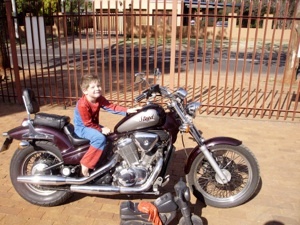 This ride belonged on the open road, eating kilometers for breakfast, lunch and supper! Lena’s Yamaha XJ900. One of the smoothest and most reliable machines ever! A shaft drive like only Yamaha can make it. Ahh yes, old faithful. Honda CB900F2 Bol d’Or. What a machine. You felt like a king riding her, always wanting to wear a white glove to wave at the crowds. A superior machine for its time. Me taking Tufan to school on the Suzuki PE185. Did I wear out soles just kickstarting her in the mornings! Vmax Owners Group - South Africa. Here she is... my current ride. And what a machine! My midlife crisis personified ;-) But seriously, my ultimate riding machine. A 2005 Harley Davidson Softail Deluxe.